The perfect Vermont location, now with air conditioning. This waterfront log cabin sits directly above the Williams River with spectacular river and mountain views west and south. Sit on the deck or in the new sun room and listen to the rapids rushing below. Go fishing for brook trout on the Williams River directly on the property. The property has one of the few swimming holes on the Williams River. The cabin has all the charm you would expect with the addition of Wi Fi for your computer and a wi fi booster, three satellite HDTV’s, a dvr, satellite radio, dvd and a cd player. It has a fully appointed kitchen, a wood pellet stove and a steam shower. The cabin now has a new sun room, that converts into a bedroom with a fold out queen bed, with a HD TV. The cabin has a large fit pit for evenings sitting by the fire looking at the illuminated rapids rushing below. This home is located in Chester - minutes from local shopping, conveniences and fine dining., 15 miles away is the Okemo Resort, Tater hill golf course, loads of great local activities for the whole family.. 8 miles from I-91. 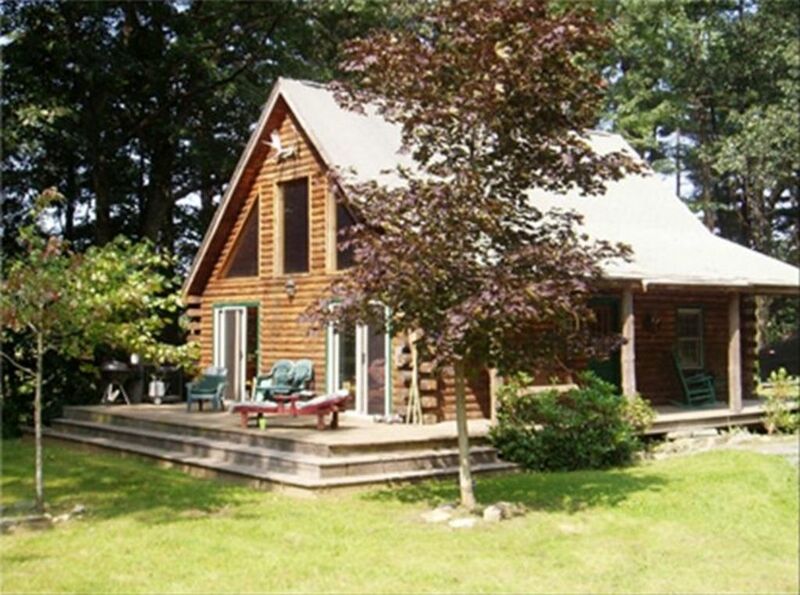 This 4 season vacation home will allow you and your guests a wonderful Log Cabin experience. The cabin sleeps eight in four bed rooms. We grew up on the New Jersey shore and settled there. We love Vermont and we enjoyed all the ski areas in southern Vermont. We finally built a true log cabin in southern Vermont. We built a log cabin in 1995. The location is outstanding. It is secluded but close to the town of Chester and near the major town of Springfield. Is on a historic dirt road that has been in place for over 200 years. Green Mountain Tpk. The road has a historic covered bridge that goes over the Williams river. Outstanding hiking, biking and river activities. Chester is centrally located to it all! The Weston Playhouse, Vermont's oldest professional theater company in Vermont hosts live performances, plays and musicals and is only minutes away! The nearby town of Bellows Falls hosts many of Southern Vermont's summer events . Love sports? There is boating, canoeing, kayaking and swimming on the Connecticut River. Enjoy hiking, mountain climbing, mountain biking, and golfing all available in the Okemo Valley area! Unique summer sports and activities include horseback riding in Woodstock, Orvis fly fishing in Manchester and hot air ballooning in Quechee. During winter months you'll find downhill and cross country skiing, snowshoeing and snowmobiling. We have rocking Chair Mountain directly behind the cabin. Great for hiking. 25 min to the top. The views and sounds are relaxing and soothing from nearly every room in the cabin, where the river can be seen and heard. A great porch added in the back with lots of light and space for gathering and talking. 6 of us plus the dog were there for the weekend for a family wedding in Grafton and this location was perfect. A storm rolled through Saturday and we returned from the wedding to darkness...no electricity. I reached out to Roy the owner who was great; called the electric company and found out when power was expected back on; walked us through where to find more candles in the house; and checked next morning to confirm power as back. I recommend the Wilkins Cabin! It is great and the owner was very responsive. We enjoyed our stay at the cabin very much. It is just as pictured and the view is gorgeous. I could have sat in the sunroom all weekend! The only suggestion i have would be curtains on the 3 sliding doors :) We would love to return someday during ski season! My husband wants to bring a map of our local mountain for your very impressive selection! :) thanks for having us! Lots of space and beautiful river! The cabin was clean with lots of space for both the adults and children to enjoy. We loved having campfires at night and playing down at the river all day. The kids went tubing even though it was a little chilly out. Took a trip to the Vermont country store which was 10 minutes away at the most. We really enjoyed our stay and would love to come back again. The owner was helpful and responsive when we had a question. Thank you! We loved our stay, the cabin was so cute and had plenty of room for all of us. Great spot and a great cabin. Nice and quiet. Love the town of Chester. Cool log cabin with everything you need. Cottage was in a perfect location. Close to Chester restaraunts with nice hiking nearby. Would be spectacular in a couple weeks in full foliage season. Went fishing and swimming in the river. Climbing on Rocking Chair Mtn. Directly behind cabin.